Pontoon - a card game that is considered to be an ancestor of Blackjack with a goal of getting as close or 21 without getting more that the amount. 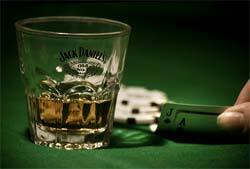 Pontoon ancestor relation is traced to the roots of Blackjack for the French game of 21. The game can be played with more than 2 players at a time, but for the best gameplay experience 5-8 players is a must. A deck of 52 cards are used to play the game, and 2 decks are used for games with 8 or more players. Chips or cash is also needed for those who are interested in placing bets. In the game a Pontoon hand is called when a players hand totals just like in Blackjack - 21 points. Considered to be the best hand in the game and is only possible with an Ace and any card worth 10 points, the hand will be rewarded in double at the end of the game. For example if you have placed a bet of $10 you will be rewarded with $20 with your bet of $10. The system of scores is just like in Blackjack, the cards with numbers equal to their face number and the face cards are worth 10 points apiece. The Ace has the same value as in Blackjack and is worth 1 or 11 points based on the wish of the player. The main goal of the game once again in comparison to Blackjack is the same - to score 21 points without going bust(getting pore that 21 points). If the player and the dealer have the same amount of points by the end of the game the dealer wins. A part from that the game receives its popularity from generous rewards with certain hands and is continually increasing the interest to it from the players.